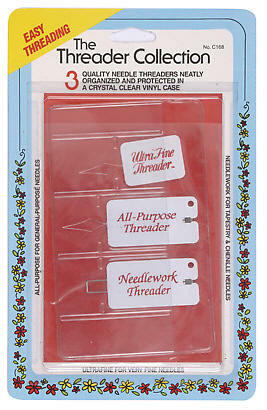 Needle Threaders - several different kinds for use with different thread weights.
. 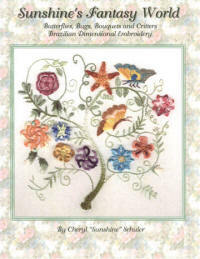 It is a good Brazilian Embroidery needle threader. It can be used for the millinery needles 1-3-5-7. The needle threader gets a lot of abuse if you pull with just the black part of the threader. I advise putting your thumb on one side and your middle finger on the other side of the wire part of the threader. This helps to keep the wires from coming out of the black part of the threader. Ever find it is hard to pick the threader off from the table? The black part of the threader can be bent up like an "L" shape for easier handling. Sturdy metal needle threaders won't break like the wire type. 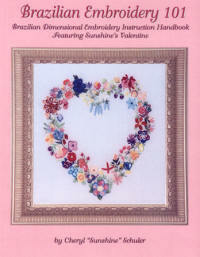 Thread fine needles with this heart shaped threader. Fine steel wire comes with a black back plate to make the wire easily visible and threading easier. About 1"
3 Ct. Threaders protected in a clear vinyl organizer. Ultra-fine Threader for very fine needles. All-purpose Threader with Cutter for general-purpose needles. Needlework Threader with Cutter for tapestry and chenille needles. Insert threader wire through needle eye. Insert thread through the needle eye. Pull threader wire back through needle eye.